Mayor Bloomberg was in Singapore last Wednesday to accept the Lee Kuan Yew World City Prize for sustainable planning, but it was the mayor’s comments on social media got the most play in The New York Times and the New York Post. Indeed. Two of the projects that Lee Kuan judges called out were conceived in a pre-social-media atmosphere: the High Line and Brooklyn Bridge Park. The third example, “re-purposing the right of way” (i.e. bike lanes and pedestrian plazas), evolved under the glare of social media. But as the mayor said in the speech, the High Line was just one court decision from being torn down when his administration took over in 2002. One can’t help but wonder how much easier activist mobilization might have been if social media were around. Instead, activists relied on community outreach and coverage in print media to save the endangered rail bed. Though Brooklyn Bridge Park began with traditional community mobilization, by the time park officials got around to proposing a hotel and residential towers within the park’s boundaries, opponents had found plenty of friends on Facebook. But among the three initiatives/projects cited in Singapore, none played out in social media more than the bike lanes. Interestingly enough, it’s here that the mayor got the most support. If you can find the wordy “No Bike Lane on Prospect Park West Neighbors For Better Bike Lanes” Facebook page, compare its closed group of 288 members to the 3,397 ‘likes’ on Transportation Alternatives public page. Transportation Alternatives has another 4,081 following them on Twitter under the handle @TransAlt. Neighbors for Better Bike Lanes isn’t on Twitter. It’s not difficult to understand the mayor’s concern. In the last month alone, social media has had a profound effect at the city’s pubic hearings and meetings. The young bucks from the AIDS Memorial Competition nearly upended the land use process for the Rudin’s plan for St. Vincent’s when they tapped into Architizer’s 450,000 Facebook fans to hold the competition mid-ULURP. Normally quiet sub-committee meetings of Community Board 2 had to scramble to find more room for the NYU 2030 Expansion Plan after Greenwich Village Society for Historic Preservation (GVSHP) digitally got the word out. 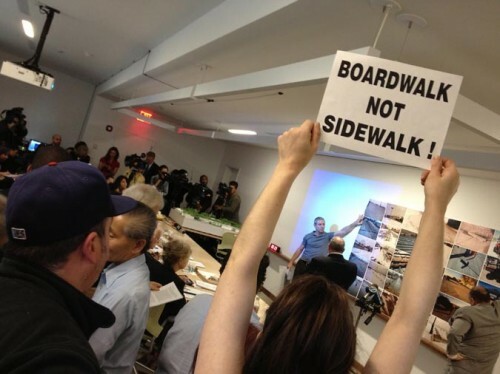 And the very staid—and sometimes dull—Design Commission meeting turned into a sideshow when Save Coney Island informed their 5,300 Facebook friends of the time and place of the meeting. Regardless of how the mayor (with his own 240,000 followers on Twitter) feels about social media, it’s here to stay. Even though the city closed down Zuccotti Park, Occupy Wall Street continues to make its presence felt online, where they plan flash demonstrations held all over town. The question is: how does the city integrate this vital new participation into the process? There are platforms on NYC.gov that allow citizens to see what’s going on, but few to interact. Researchers at NYU’s Polytechnic Institute have been developing Betaville, an online, open-source platform where residents can do a 3-D fly-through of proposed projects and make comments. At the GVSHP kickoff meeting to oppose the NYU2030 expansion plan, one gray-haired woman said to another gray-haired woman that there was just too much gray hair in the room. As the various CB2 subcommittee meetings progressed through the month of February, more and more students who opposed the plan began to show up, as did their NYU professors. How did they get the younger turnout? Word of mouth, flyers, and, of course, social media.